Here's my drawing of Mike Allred's awesome character Madman. and I love it. Hope you dig the drawing. Thanks for looking! Ka-Pow! 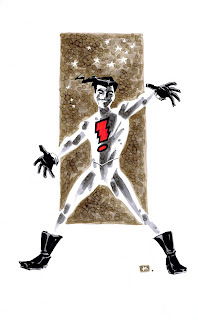 More nifty Madman art! Now I know what Tom Sawyer and Huck Finn were feeling when they watched their own funeral! Way ta go, Andy! You are the man, AK! YAY! Love the wonderful Watercolory* effects here.